Oklahoma… the Sooner State… and the 19th state we have visited on our journey. What’s a Sooner? That’s what we wanted to know! Sooners were settlers who got a jump-start on land claims during a land run in the late 1800s; beyond that, too hard to explain… just Google it to get more information! Oklahoma became a state in 1907. The state’s slogan is Native America because 55 distinct Native American tribes lived there. We were not expecting to love our time in Oklahoma — and except for all the mentions of storm cellars and tornadoes — we were quite surprised with what we found… especially in our first venture into the Tulsa area. Tulsa is the former “Oil Capitol of the World” and Oklahoma’s second largest city. 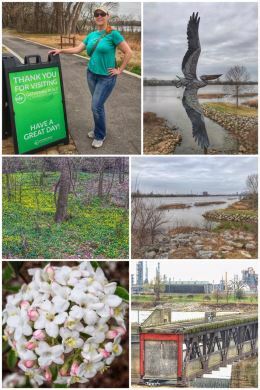 Tulsa (or T-Town as some call it) really surprised us with all the amazing opportunities for outdoor fun, recreation, biking, and hiking — especially using locations on both sides of the Arkansas River. We started our adventure walking the River Walk up to The Gathering Place on the east side of the river, just south of downtown. This 100-acre area –whose name intentionally addresses the city’s need for inclusion after many decades of racial tensions and limited resources in poorer neighborhoods — offers both a bike trail and a walking trail and includes a skateboarding park, mountain-biking track, street hockey venue, pavilions, regular and splash playgrounds, basketball and volleyball courts… and so much more. It has cost almost $500 million to construct, with the bulk of that money coming from Tulsa billionaire and philanthropist George Kaiser. It was named the Best New Attraction in the nation in 2019 through the USA Today Readers’ Choice awards — and will eventually include a new pedestrian bridge across the river to connect to trails on the west side. The Tulsa River Parks Authority now oversees the park — with the help of a $100-million endowment from the Kaiser Family Foundation. You have to see it to believe it! 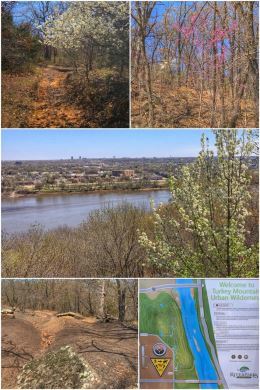 Another great public space — it too partially funded by George Kaiser’s foundation — is Turkey Mountain Urban Wilderness Area. 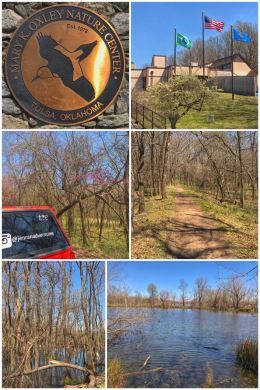 This 300-acre area of undeveloped land is also managed by Tulsa’s River Parks Authority, and is a beautiful area with miles of intersecting trails for hiking, mountain biking, and horseback riding just south of the city, on the west side of the Arkansas River. Amazing that some of the land was once the site of oil well drilling — the remnants of which can still be seen (even after a massive clean-up operation). 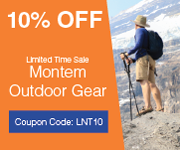 The Mountain is traversed by a section of the 1904 Midland Valley Railroad line, now owned by the Union Pacific Railroad and operated by the Tulsa-Sapulpa Union Railway (for short-line freight movement). It is believed that the name Turkey Mountain stems from the likelihood that the area was once a popular spot for hunting wild turkeys. Lots of other lore about caves, petroglyphs, and Vikings surround the property. 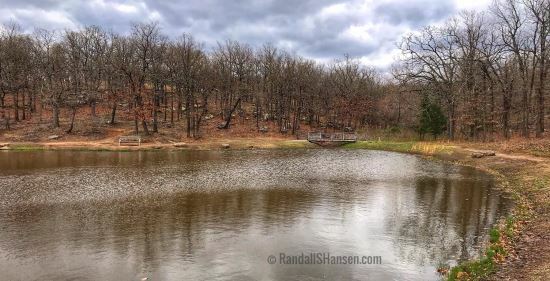 After hiking almost 4 miles up and around Turkey Mountain on the Yellow Trail, we headed to the Mary K. Oxley Nature Center, an 800-acre park with a wonderful interpretative center, located within the 2,800-acre Mohawk Park. The nature park has a large number of intersecting trails totaling about 10 miles — most fairly short. (Some were under water when we visited.) From the Interpretative Center, we hiked along the Red Fox Trail, connected with Bob’s Trail, to the Green Dragon Trail, along the Woodpecker Trail, and up and around the Blue Heron Trail (which loops around one of the old fish hatchery ponds, with views of Lake Sherry) before heading back the way we came… for a total of about 1.5 miles. On our way back to our campground, we drove around Mohawk Park, which interestingly owes much of its original roads to work completed by the Civilian Conservation Corps (CCC). The park was originally created as part of the 1924 public works project that piped drinking water from the Spavinaw Dam to Tulsa. It now includes the Oxley Nature Center, Tulsa Zoo and Mohawk Sports Complex… with swimming pools, water playgrounds splash pads, sports fields, tennis courts, skate parks, and more than 60 miles of trails. It also includes 65 picnic shelters. The next day was a mix of wine-tasting and nature — the perfect combination for us! We tasted at two area wineries. We started out at Whispering Vines Vineyard, about 7 miles southwest of downtown Tulsa. This family-owned winery has two vineyards in the area and produce a range of fruit and grape wines, from dry to very sweet… with some of their wines produced from grapes grown in Washington State. We left with a bottle of their Cabernet Sauvignon and Syrah. 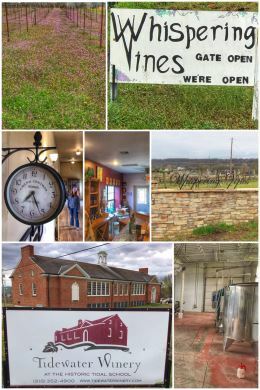 We then traveled way out of town to Drumright’s Tidewater Winery, located about 40 miles southwest of Tulsa, and housed in a historic (and on the National Register of Historic Buildings) schoolhouse. The building was originally built in the 1920s by John D. Rockefeller’s Standard Oil Company to educate the children of its employees during the area’s oil boom; later it was used as a recreation center for the school district, before finally being purchased and transformed into a winery. The winery features a tasting room and gift shop, banquet room, and outdoor patio overlooking the vineyard. We enjoyed some fine wine-tasting and a great tour of the building — while the winery gets new life with new owners. We left with a bottle of their Cabernet Franc Reserve. Oklahoma has six wine regions, though the bulk of wineries are in the central and northeastern parts of the state — and none in the panhandle. The state had vineyards as early as the 1900s, but the Depression, Prohibition, and the Dust Bowl ended the industry for decades to come. It ranked almost last in the number of wineries, but now ranks fifth — with more than 60 wineries producing commercial wine. 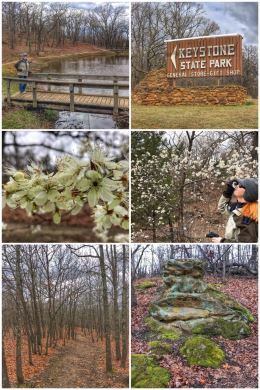 As we looped back to Tulsa, we got our nature fix at Keystone State Park, about 17 miles west of Tulsa — shown in the featured blog photo, as well as in the accompanying photo collage. This 715-acre park was established in 1966 and includes a reservoir formed by a dam on the Arkansas and Cimarron rivers. The park, lake, and dam are all named for the community of Keystone. The park offers both primitive camping as well as full hookup sites for RVs… and also has rental cabins. Boat ramps and boat rentals are also available. Of course, our main focus was hiking — and we hiked two of the park’s trails. We started on the 1.3-mile Ranger Trail (which starts right across from the park office/store) and crossed over to the 1.5-mile Lake Trail. We thoroughly enjoyed our visit in T-Town. The RV park we called home during the stretch — Mingo RV Park — was a bit older, with small spaces, but it has a great laundry room with individual shower/bathroom combos. 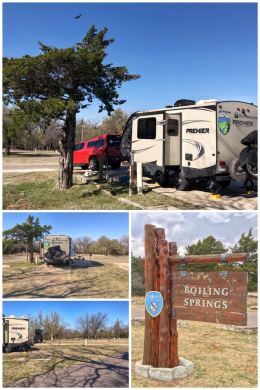 From Tulsa, we landed in Woodward, Oklahoma, in the northwest part of the state, choosing to hike and camp in Boiling Springs State Park, an 820-acre park that sits adjacent to the North Canadian River, a tributary to the Arkansas River. 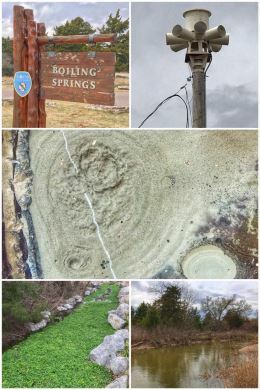 The park is named for the bubbling, “boiling” spring that still flows — and is shown in the photo collage. It sits directly below the park office. The area in which the park now sits has long been called an oasis because of its numerous underground streams, which come to the surface (springs) in multiple areas — unusual given the surrounding area is a semi-arid climate. The land that comprises the park has been used by people for many decades, but it was not until 1935 when the city acquired the property — with much of the improvements made by a company of the Civilian Conservation Corps (CCC), under the supervision of National Park Service architect Herbert Maier (and his team of architects, engineers, and landscape designers). The CCC built the pool bathhouse, group camp, picnic pavilion, cabins, springs pumphouse, and stone walkways. We camped in the Whitetail Campground, one of two in the park. We chose the Whitetail because it includes 10 “premium” pull-thru sites with full hookups. Both campgrounds offer some amenities — including showers/bathhouses (that include a storm shelter), dump stations, playgrounds, and trails. While the facilities were a bit rustic, we loved that we practically had the entire campground to ourselves. 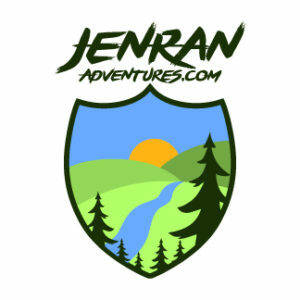 Speaking of trails, the park has several, including: Boy Scout Nature Trail (1.75-mile loop), River Trail (.75 miles), Burma Road Trail (1.5 miles), as well as several smaller and connecting trails. We enjoyed several of the trails while the weather was good. When we checked in to the park, we were told there was a sight chance of a tornado touching down. We can happily say that neither the tornado nor the expected hail showed up. Instead, we had a bit of rain and wind. Phew! And the next day, as we prepared to head to our last stop in Oklahoma, we were met with a beautiful, sunny day! 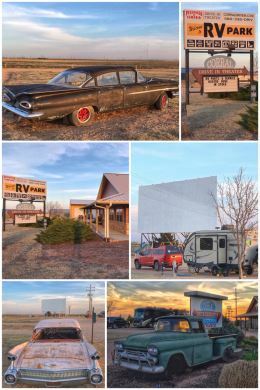 We ended our visit to Oklahoma in Guymon, right in the middle of western panhandle, staying at what became one of our favorite RV parks: Corral Drive-In RV Park. While the owners made the decision to close the drive-in theater, the RV park is open for business — and includes long and wide RV spaces (both pull-thru and back-in), full hook-ups, RV store and repair, as well clean and up-to-date laundry and bathrooms/showers. The owners are very friendly folks who are also RVers, so they designed the park the way the amenities they most appreciated when they were on the road. As you can see from the photos, they also have some classic vehicles sprinkled throughout the park, adding to the fun. We spent a chunk of our time working, but also got out and enjoyed different elements of the town. 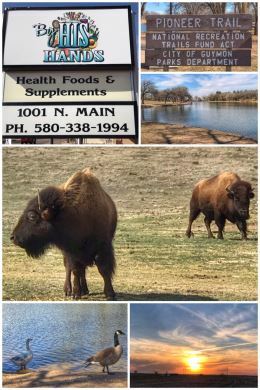 Just north of the park is the Guymon Game Preserve, a 160-acre enclosed park that includes Bison, Oryx, Watusi, Elk, Deer, and Longhorn Cattle. We are still not sure how or why the city has it, but it was cool to see the Bison! We later discovered the buffalo (American Bison) is the official state animal. We ended our errands with a stop at an aptly named natural foods store — By His Hands — where we purchased local eggs and a few new brands of no-sugar and organic products. The store also sells vegetables, supplements, and more. Our last night in Guymon convinced us it was time to get out of Oklahoma and into Colorado, as strong winds rocked and pushed our travel trailer all night long… we liked you, Oklahoma, but not your winds. As we travel to Colorado, we will pass through Boise City, one of the key towns highlighted in Ken Burn’s documentary The Dust Bowl.